TrekMovie sources have confirmed that Nimoy indeed is back as Spock Prime and he has already completed his work for the film. We’ll see. Usually Trek Movie has been well informed. 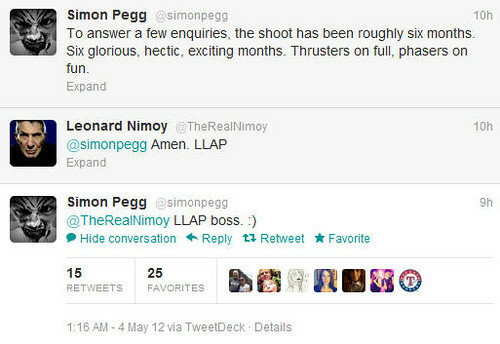 Maybe it’s all a ploy by Abrams to give us something to talk about while we wait for the movie to come out ;) Meanwhile, here's a bit of an update by Simon Pegg, who plays Scotty, commented on by Mr. Nimoy. Since its launch in 2010 as a small shop on Etsy.com known as “Secret Selves,” ShopLLAP has grown to become an online store carrying products relating to Leonard Nimoy and his role as Spock in Star Trek: the Original Series. Our mission is to make available authentic and unique memorabilia relating to Leonard Nimoy, Spock, and Star Trek. 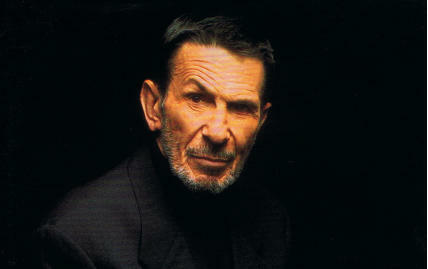 Some of our products are from Mr. Nimoy's personal collection as well. Please let there be many photos of that. And I'd be on overload if Benedict Cumberbatch would be there, too. 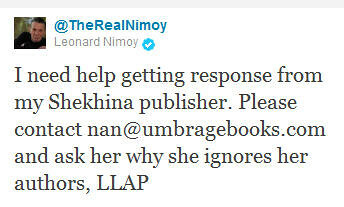 Because of problems with the publisher of his first book of photography, Shekhina, Mr. Nimoy asks for help from his followers. Incidentally, I tried to order a copy at the beginning of November from Amazon. They didn't have it in stock, so I choose to be notified when the book would be available again. About a week later I was notified that they won't be able to deliver and my order was cancelled. One can at least dream. 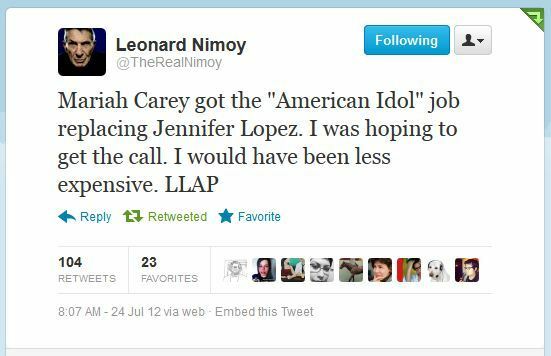 OMG Mr. Nimoy! I’m your huge fan! um…Mr. 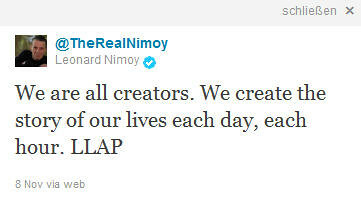 nimoy are you sleeping now? 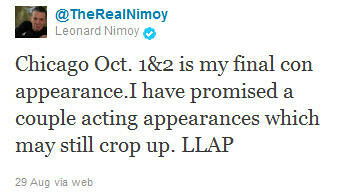 Thankfully for us fans the path to Mr. Nimoy's retirement is still paved with upcoming appearances. 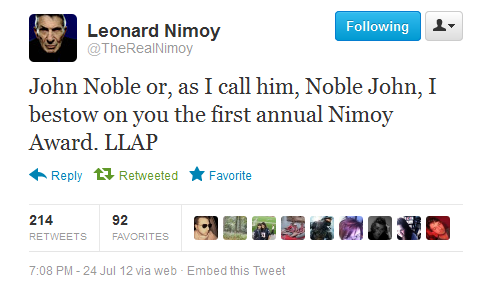 Mr. Nimoy is writing poetry again and has created a domain for that purpose. Read Irish Eyes at www.leonardnimoypoetry.com. 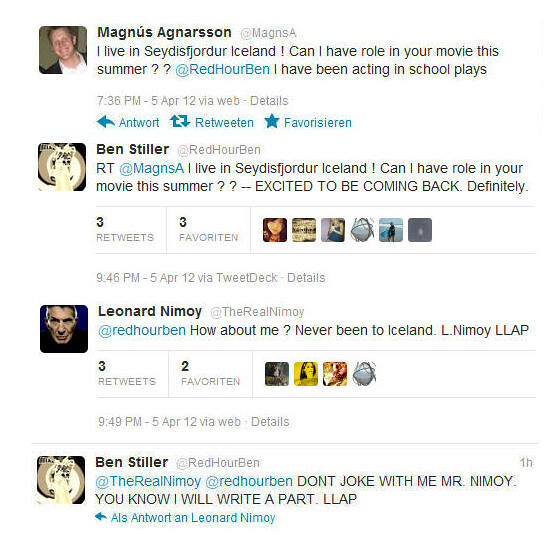 Mr. Nimoy twittered a link to this article on Screened "Mr. Spock, Space Wizard. An exploration of how the concept of the wizard translates into science fiction television and films with your friend Mr. Spock from Star Trek." 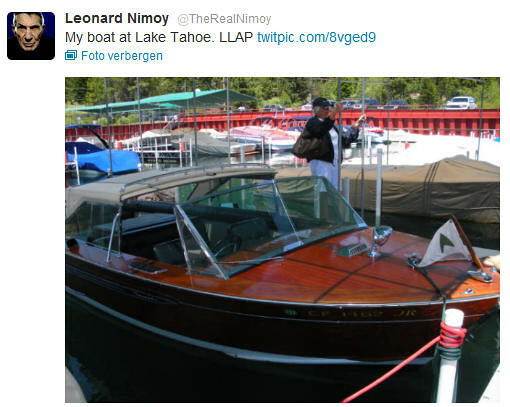 YouTube not only gave new life to In Search Of... which Mr. Nimoy hosted, but also to his singing career and it seems he's getting a kick out of it, tweeting the link to a video created with Go!Animate to his rendition of The Mayor of Ma's Cafe. 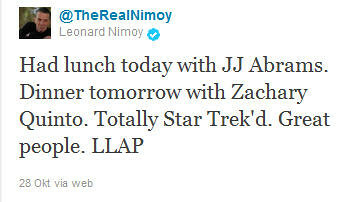 On November 15th 2010 Mr. Nimoy had us guessing what this cryptic message might mean. 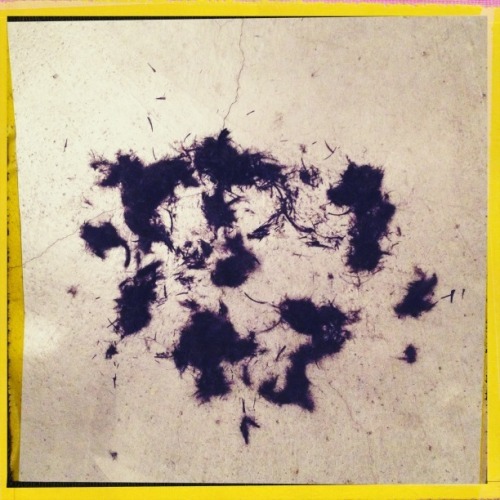 On November 19th he uploaded a scan of his poem to twitpic and the riddle was solved, and the poem identified as being from Warmed by Love. On Friday morning (at 4:23a ET), the astronauts on Shuttle Discovery in orbit were woken up to the classic Gerald Fried fight music (“The Ritual/Ancient Battle/2nd Kroykah") from the classic Star Trek episode Amok Time. The music was selected for the crew by their Earthbound training team. 722,662 votes. Listen live on March 8 at 2:23 a.m.
671,134 votes. Listen live on March 7 at 2:23 a.m.
By retweeting the information Mr. Nimoy also helped with promoting NASA's "Space Rock" contest. While making the Star Trek film, Zachary Quinto and the original Spock, Leonard Nimoy developed a strong bond, that continues on. 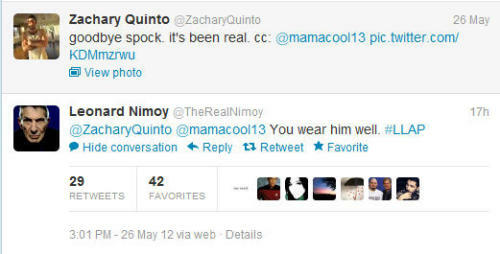 And to show how strong that bond is, Quinto will be spending his birthday evening with Mr. Nimoy. Leonard sent out a tweet this morning, saying "In NY. Meeting Zachary Quinto for dinner tonite. 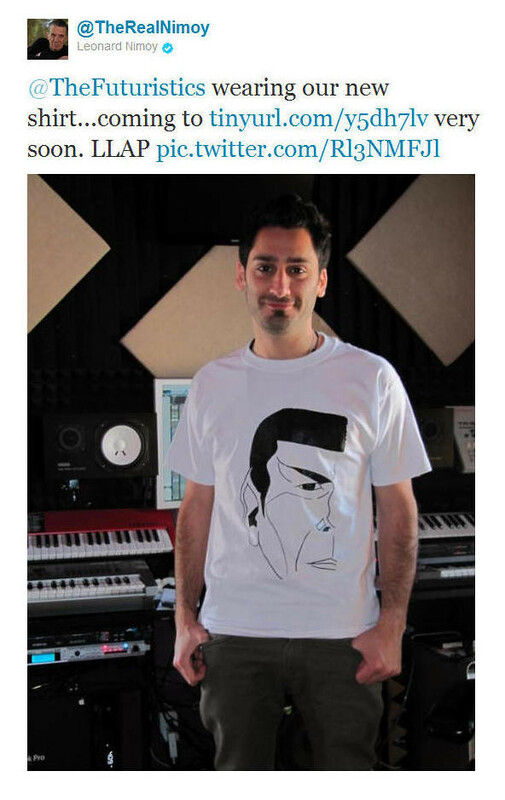 LLAP", to which Quinto replied "only the best birthday present ever!!! can’t wait sir." Zoe Saldana...where were you when I was doing the series ?? Bill: Outgoing Mayor of Calgary said I should run for the office. Me as Mayor and Shatner as Governor General!! This Global news report about Mr. Nimoy visiting Vulcan also picked up on the story of the Shatner for Governor General story, thwarting hopes by relaying that while Mr. Shatner felt flattered he's not interested in the job. Home for two days. Next, Colorado Springs and then VULCAN and Calgary !! Finishing work on Fringe today. Really good experience. The two parter will air in May.